LONDON’S sky has been lit up this week with all the red carpet premieres of the BFI London Film Festival. Carey Mulligan and Keira Knightley got things going with the premiere of Never Let Me Go, where they wore Vionnet and Chanel respectively. The premiere of Blue Valentine saw Michelle Williams in an Erdem dress and Charlotte Olympia heels, while Freida Pinto has been impressing in Dior and McQueen at the Miral premiere and press call. Elsewhere, Hilary Swank chose Donna Karan for the premiere of Conviction – and Lanvin for its press call – while home-grown export Minnie Driver wore Marchesa. THE film festival red carpet baton has passed from Venice to Torronto, with Carey Mulligan, Megan Fox, Blake Lively and Natalie Portman taking their places on the red carpet. Other starlets impressing at the Canadian film festival include Marion Cotillard, Rachel Weisz and Jessica Alba. Be sure to click back for all the latest looks from the starriest premieres at the festival. From September 1st to 11th 2010,In the splendid Venetian Teatro Tese in Arsenale.During the 67th Venice International Film Festival,Jaeger-LeCoultre hosted prestigious guests, press and friends of the Brand including Clive Owen, Rosamund Pike, Vanessa Mae, Jeremy Renner, Marc Newson and Charlotte Stockdale, Jasmine Le Bon, Amber Le Bon, Simona Ventura, Ksenia Alferova, Luana Piovani, Eduardo Novillo Astrada and Astrid Munoz, Donnie Edwards, Norma Naoum and Micky Green. VENICE – Italy, 3 September 2010. Jaeger-LeCoultre debuts its Haute Joaillerie “La Rose Blanche” on the red carpet of the 67th Venice International Film Festival. Jaeger-LeCoultre is presenting some exceptional timepieces at La Mostra, each of which displays an aspect of the Manufacture’s expertise in the traditional metiers d’art of high watchmaking. These are the first photographs of this exceptional timepiece. 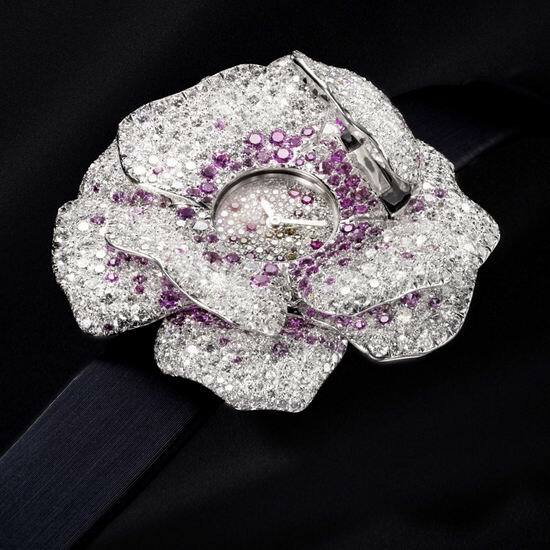 The Rose Blanche focuses on the art of gemsetting. Actress Margareth Madè wore the exceptional timepiece to the Opening Ceremony Dinner at the Excelsior Hotel in Venice. The Rose Blanche is equipped with the mechanical manufacture JLC Calibre 846 and is set with 1,210 gemstones: 900 diamonds and 310 sapphires. 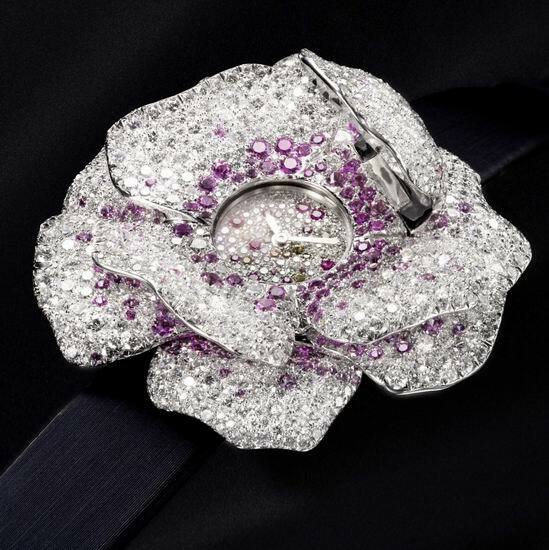 An extraordinary 18-carat creation blossomed after 225 hours in the gemsetting workshop of the Manufacture. The timepiece’s dial is hidden beneath a diamond and sapphire bombé pistil. The pistil opens to reveal the time on a diamond and sapphire dial with white gold hands.